Motivation comes in many forms. For Ben, it came with the help of a team. Tired of being skinny, he dedicated his life to Team MAP and learned the necessities of fitness competitions! I had a very small build in high school, but it didn't seem to bug me at the time. When college hit, I started to notice that I didn't want to be the "skinny guy" anymore. So I made a choice. I dedicated my life to diet, training, and reading to understand what I was doing and why. I joined a team called "Team MAP," which is a group of individuals who all have the same dreams of nutrition, health, and well-being. 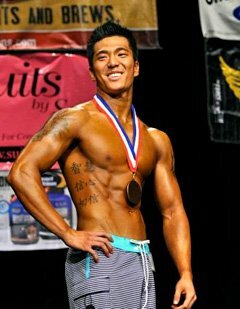 I did my first competition for Men's Physique at the 2012 Detroit National Qualifier and placed third with my team. Ever since then, I was hooked. As part of Team MAP, Ben can pinpoint his final destination. I like to warm up on treadmill or bike for 5-10 minutes and think about what I am going to lift. The mind is everything. If I can focus my mind in this period of time to make sure I am getting 100 percent out of my muscles then my lifts will have a better outcome. I was always in awe of the accomplishments one can make if given the proper diet, work ethic and drive to become something. Not only does it help my overall health, it has also given me a chance to give back to the community, which is most important in my mind. I love to help people, so when people ask me for advice, I will gladly help them with any of their needs. I will not only give them the answer, but I will point them in the right direction, because it will mean so much more when they find the answers within themselves. TeamMAP has always been there for me. Shout out to my teammates Paul "ProteinP" Harris, Moe "ABSolutely" Williams, Nikki "ClassA" Morgan, Lindsey "Sin_a_Bunz" Erikson, Ashley "Curlz" Pecott, and Kenney "SilvrBak" Matthews. Change and my team; I don't know where I would be without them. Eric Thomas A.K.A. Hip Hop Preachers videos on success have helped me open my eyes and realize what I am doing. Kai Greene has also been a great inspiration to me as well. He has a mentality that few men have, and that is why he is so great. It's not just the body, it's the mind that matters the most. So I try and strive for this every day of my life. My future plans are to obtain my pro card, and then give back to the community and the sport. Failure is only a fact when you give up. Everyone gets knocked down; the question is, will you get back up? Never give up on your goals no matter how hard they may seem. If this is something you really want, you can get it. You just have to put your mind to it. The mind is so powerful. If you train as hard as you can, diet your best, and show up with a smile on your face, no matter what place you get, you can't lose; you have already won. Kai Greene, Arnold, and Flex Wheeler. Kai Greene because he has such a strong mindset, Arnold because he was a pioneer in his sport of choice and made his dreams become a reality, and Flex Wheeler for having the most ridiculous body I have ever seen to date - his proportions, symmetry, and just overall confidence is amazing to me. Bodybuilding.com has so much information that if I didn't train I would be on the site 24/7. The amount of information given to the public is awesome,whether it's nutrition, training, tan, or what supplements might work for you. The articles and interviews of the pros are great too. They help inspire and even evoke emotion.